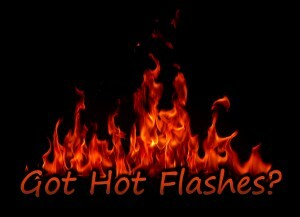 Posted on July 15, 2014 | Comments Off on Got Hot Flashes? Perimenopause, a time of shifting hormonal fluctuations, generally begins between the ages of 45 -55 and can begin up to 10 years prior to actual menopause. During this time of transition to gradually occurring natural menopause, which most women reach around age 51, many women experience some very uncomfortable symptoms such as hot flashes, night sweats, mood swings, vaginal dryness and atrophy vaginitis. While not all women experience these and other symptoms, approximately 80% of women suffer from some form of hot flashes or flushing before, during and after menopause. Hot flashes are a very common symptom that may wax and wane in severity and are likely due to hormonal and biochemical fluctuations caused by declining estrogen levels. Although the average length of time that women experience hot flashes is about 5 years, the extent and severity of symptoms is unique to each woman. While some women have minimal problems, others have symptoms that can last for an extended time period. Lifestyle habits such as smoking, poor nutrition, less than ideal weight, lack of exercise and high stress levels may contribute to more severe symptoms. Likewise, healthy lifestyle habits including proper nutrition, regular exercise, not smoking and losing weight if needed, all contribute to overall health and wellness. At this stage of life, women are more susceptible to developing other health conditions. Low estrogen levels can contribute to an increased risk of developing cardiovascular disease and osteoporosis. Regular exercise can strengthen your bones, help you to maintain proper weight and can elevate your mood. Smoking can trigger hot flashes and is a risk factor in the development of many serious health conditions including heart disease and osteoporosis. Reducing excess body fat supports more balanced estrogen and progesterone ratios. Decreasing your caffeine and sugar intake may help to limit bone loss and support the liver’s ability to metabolize estrogen. Properly balanced microflora in the digestive tract aids in the metabolism and utilization of estrogen. Stress reduction helps to keep hormones and neurotransmitters in balance, which may help to limit hot flashes and stabilize mood. Studies show that up to 80% of women may use non-prescription products, such as dietary herbal and nutritional supplements, to relieve menopausal symptoms. An important thing to remember is that menopause is a natural part of life with symptoms that can be managed. Estrovera by Metagenics – This completely natural formula has been clinically shown to be significantly effective in decreasing menopausal hot flashes, mood swings, sleep disturbances and other menopausal symptoms without the risk of side effects. AM/PM Menopause Formula by Integrative Therapeutics – This formula provides an herbal hormone-free solution for natural relief of menopausal symptoms. The morning tablet provides an energizing formula for day and the evening tablet provides sleep support without morning grogginess. Kavinace Flash-Ease by NeuroScience – This proprietary blend addresses hot flashes, helps to manage stress and supports healthy mood and sleep. OstaDerm V by Bezwecken – With daily application, this cream provides relief of symptoms associated with vaginal dryness and atrophy vaginitis. This product contains plant derived estrogen and progesterone extracted from wild yam and may also be effective for insomnia, hot flashes and mood swings. Menopause Support by Vital Nutrients – This combination herbal formula is specifically designed to alleviate hot flashes and other common menopausal symptoms. This entry was posted in Home and tagged AM/PM Menopause Formula by Integrative Therapeutics, Estrovera by Metagenics, hot flashes, Kavinace Flash-Ease by NeuroScience, menopause, Menopause Support by Vital Nutrients, OstaDerm V by Bezwecken. Bookmark the permalink.